Before launching into Good Fortune and Soap for Hope, let me introduce a 10-year old girl named Jennifer. I was a clever and adventurous girl who passed the time inventing, crafting, and annoying my brother. My family was never certain if I would spring out of bed as an Indian, comedian, or zoo keeper-whoever I was, each day was an exciting journey. I was dedicated to living life to the full. Fearlessly I took (still take) risks! On one day, I decided that our family’s pet, Snoopy, needed a snazzy new haircut. Our entire neighborhood laughed at my horrible grooming skills, but Snoopy didn’t laugh! As I matured, so did my business skills, and by 12 I started my first business called "Jennifer Fantistics.” Not a great speller, I was a born entrepreneur. 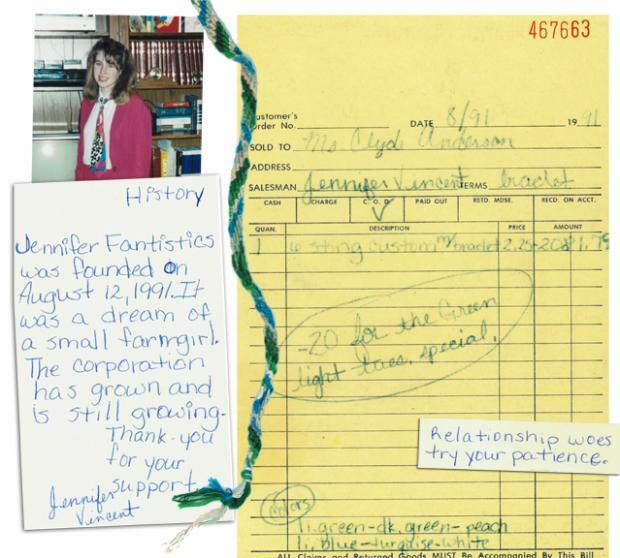 Jennifer Fantistics, a handcrafted bracelet corporation, was known for its customer service. Each order was carefully packaged with a handwritten note explaining the history of the company, a detailed invoice, a generous discount for new customers, and a lovely fortune (kind of ironic, huh?). Business ideas continued to flow, and I was excited to grow up, go to college, and someday have a real job (and maybe even own my own business). Tough times were no stranger to me. I struggled to find my identity (as most teens do), made some bad choices, and often learned the hard way. While I always found an outlet in art, I still longed for deeper meaning to life. Four years of college helped me learn intense focus and helped with goal setting, which led to an amazing job as a graphic designer. Within my first year, I was awarded the highest company honor and employee of the year. I continued to improve as a designer and photographer, and within only 4 years was promoted to Senior Graphic Designer. Still, I longed for deeper meaning in life. Through a series of failed relationships, I realized that fulfillment would not come from men, work, or myself. I felt lost, and through the advice of a co-worker was encouraged to pray for wisdom because it was the only thing God promised He would definitely give when we ask. Pray for it, and you WILL get it. A sucker for guarantees, I began to pray and ask God to show Himself, help find purpose in life, and to experience a love greater than I felt. It didn’t take long for God to make good on his promise. He shared with me the secret to life and happiness. Wondering why it took so long to learn the truth, I joyfully moved forward and was ready to start living. Armed with the truth that life flows from God, and that God is love, I was gifted a faith I’d never felt before. To know that Jesus Christ walked the earth teaching love and ultimately died for my sin, was heartbreaking, but comforting. I finally knew what unconditional love felt like and held on to His promises to never leave or hurt me. My once broken heart was rebuilt and began to overflow with love. I had a new purpose in life: to learn how to love others as Christ! I worked in the corporate world for many years, but was ready for a change and longed for a different career, a lifestyle that fed my mind, body, and spirit while also providing a way to connect with and help others. While lying in bed, praying, and reading a book on soapmaking, the Lord spoke to a deep down place inside me. Through faith, I knew instantly that my love of design, photography, and handcrafted things was my calling. With 110% enthusiasm, I followed the plan that God had whispered. 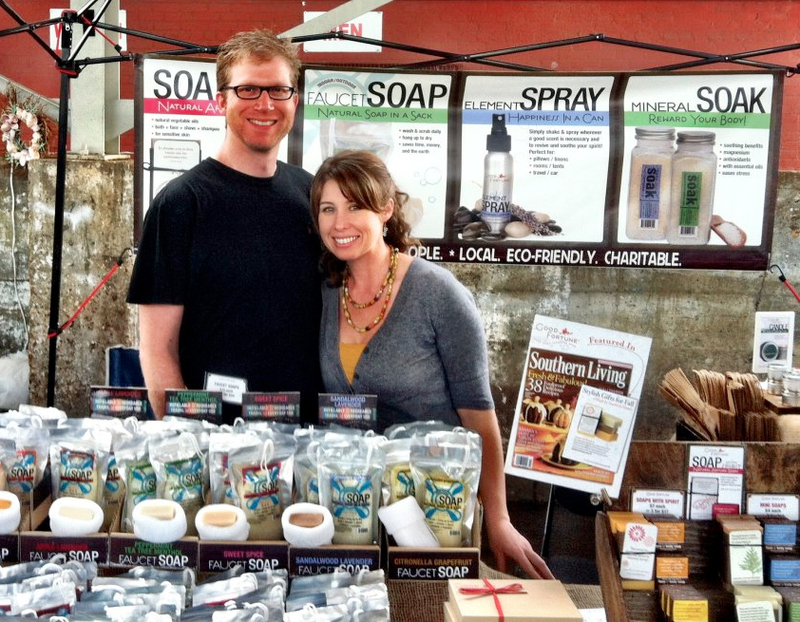 In May 2006, in Chattanooga, Tennessee, Good Fortune Soap was born. 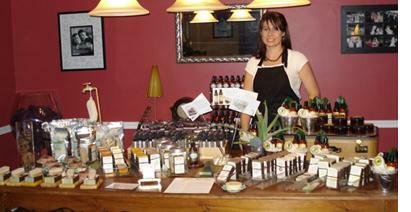 From day one I studied soap making, natural ingredients, and the natural products industry as a whole. The fearless mad scientist I knew as a child took over as I experimented by making hundreds of batches of soap, scent combinations, shapes, colors, and more. Self taught, I perfected the process night and day while working full-time as a graphic designer. After 8 months in the lab, December 2006 marked Good Fortune’s first big open house. In just two days, I sold hundreds of bars of soap and gift sets. Further, two Chattanooga, TN-based gift shops placed orders, purchasing Good Fortune’s entire collection of scents and gift sets. This success prepared me for the next step-going full-time with soap. Most people knew I was clever, but secretly thought I was crazy for "following a promise from God to make soap.” I knew that by traditional standards it was a risk to quit my job, and I’d have to give up most luxuries, but the promise was real. Life was just beginning. Without hesitation, I took the plunge: sold my house, quit my stable job, and took Good Fortune all the way. But first I had to take a sabbatical. The timing couldn’t have been more perfect. My love of people had grown and my love of stuff was gone. Having given away most of my possessions, having just moved into my new one-bedroom apartment, I left to go to South Africa for 10 days with a dear friend. Little did I know God planned to break my heart so I could love more deeply like Him while also giving me fuel for Good Fortune. 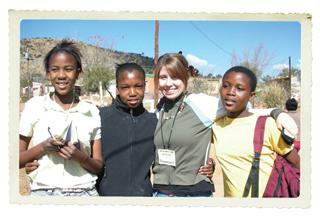 I volunteered to minister and love children while in South Africa. 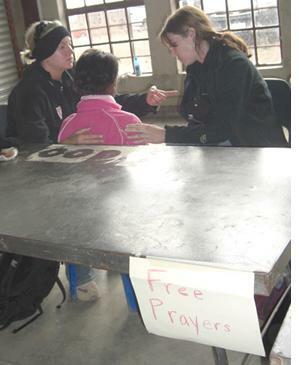 Witnessing poverty, illness, and homeless children, my vibrant heart was crushed. Unconditional love, compassion, and generosity took on new meaning to me. The beautiful people of Mamelodi were the sweetest, happiest, and most loving people I’d ever met, yet had so little. It was obvious that God has a huge heart for Africa, despite their overwhelming needs. Their joy was not based on circumstance, but on perspective and a love for Christ. After a few days of singing, hugging, and playing with the children, my creative business side began to surface. Why did God bring me here and what did He really want me to do? Was it to play with children or did God want more? Deciding to spend more quality spiritual time with the children, I grabbed a crayon and made a "free prayer” sign while my friend grabbed a desk and 3 chairs. We were amazed at what happened next. The free prayer booth grew longer than all of the games, painting, and activity lines. Without a plan, each child sat down one by one, with their backs turned from the crowd, waiting to be prayed over. Amazingly, I never cried in front of the children, though had no idea what huge problems burdened such tiny hearts. Their precious tears and stone cold expressions still linger: as they shook there heads "yes” and told us to pray for their mommy and daddy. When asked why, some would reply their parents were sick or dead. The children longed so deeply to be held, touched, heard, and reassured that it was going to be okay. Who really knew if they would be okay, safe, fed, or healthy? They were reassured that Jesus is their love, provider, and Father. Even through their pain and confusion, God was alive in their hearts and no one could take that away. My problems paled in comparison to looking into the face of a suffering child. After all, I asked God to show me how to love like Jesus, and He’d just shown me. Joyfully, I wanted to know how to continue to love and inspire others to do the same. Coming home, I needed to create a business plan that configured how Good Fortune was going to change the world. I didn’t just want an amazing product that I could bank. I wanted products that embodied positive thinking and touched people’s lives physically and spiritually. The healing ingredients, recyclable packaging, and charitable donations were marketed to spread the word about the spirit of the company. Giving back is a concept that was built into the foundation of Good Fortune, in fact, that is where we got our name. From the moment God whispered His plan, He also asked me to bless others. Good Fortune supported several charities for the hungry, impoverished children, and hurting women, but nothing felt like a perfect fit. Unsettled by this, I again asked for wisdom, and again God spoke. Building a business, creating products, empowering women, and loving others was God’s plan all along. Good Fortune Soap sprang from this fertile soil. The soap idea originated in her heart, started in her kitchen, and grew to her family's dairy in the Appalachian foothills of Tennessee. Jennifer and her mother worked side-by-side renovating her grandfather's dairy barn, where Jennifer grew the company for several years. Married in 2012, Jennifer brought on Mr. Good Fortune (aka: her husband Howell). The business plan changed a bit, and they decided that after growing by leaps and bounds they'd settle down in Chattanooga, Tennessee. Good Fortune Soap & Spa embodies a production studio, store front boutique, organic spa, and wholesale business at 2644 Broad Street in Chattanooga's downtown district called Southside. Jennifer is still passionate about giving back to the city, offering new all-natural skincare products, educating customers about essential oils, providing locally made gifts, and pampering customers at her spa. We invite you to visit or store in Chattanooga to shop, relax at our spa, or schedule a spa party. Thank you for giving and growing with us.